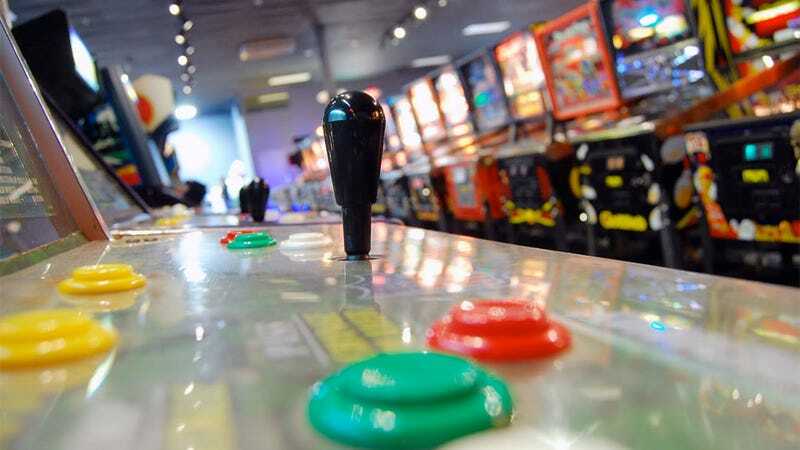 The American arcade, on the verge of extinction, has been given new life with the opening of a New Hampshire based arcade. Writer Jon Lynch visits the newly opened Pinball Wizard, speaks to its proud, passionate owner and returns with this report. Tucked in the corner unit of a shopping plaza in sleepy Pelham, New Hampshire, the Pinball Wizard Arcade gives few clues to its existence aside from its crisp looking billboard. But head through the doors, past the front counter, and down the arcade's aisles of vintage games and a single fact becomes overwhelmingly apparent: this very well might be the next great stronghold of classic gaming in New England. "What was the first thing you noticed when you walked through the doors?" asks Sarah St. John, owner of the Wizard. I tell her that I was impressed by the condition of her machines. "That's right," she says, "this is something I take seriously." Standing two inches taller than me and sporting a firm handshake, St. John is not the type you'd imagine running an arcade. But as we weave between classic Williams cabinets and pinball machines, St. John listing stats and dates for each game, you get the sense that this woman is less an arcade owner and more a veteran curator in a buzzing, flashing, neon-lit museum. St. John has owned and maintained pinball machines since high school. "It's my passion," she says. A member of the Boston Pinball Association, St. John describes herself as "a gamer, period. I'm die-hard pinball fan, I'll do anything to play." But her collection isn't limited to pinball cabinets. Coming upon two machines, St. John turns to me and says "Did you see the Fighter? The Mark Wahlberg movie?" I told her I had. "Do you remember the scene in the bar, with the two arcade cabinets in the background?" I didn't. "These are them. Crystal Castles and Joust. They were in that movie." And for the first time during the interview, something creeps into the even, measured tone of St. John's voice. I realize it's unabashed pride at these machines. They are, without a doubt, the most impeccably restored machines I've seen in person. You'll be hard pressed to find a burned-in screen or a sagging, wobbly joystick on the premises. This quality extends not just to the older pinball games, but right up to cabinets from the mid-90s and onwards. Even more astounding is the fact that they're all available for public play. When I ask her if she's concerned about having her cabinets (of which a substantial amount are from her own collection) out on the floor, St. John doesn't bat an eye. "It's what they're made for." It would be one thing if St. John was running a museum. But what she has planned for the Wizard is something else entirely. She points to two large LCD screens on either side of the arcade floor. "You'll be able to see the high scores for games locally and nationally on those TVs," she tells me. The games will be connected to a database of high-scores via an online service, allowing players at the Wizard to log their scores in real time. I ask her if she aims to bring back competitive gaming to the arcade scene. "Absolutely. I'm hoping to keep the hobby alive." Currently, there are plans for monthly tournaments, alternating between classic and modern games each month. With nearly three-hundred cabinets over 9800-square-feet, the possibilities for home-brewed competition over high scores and bragging rights are endless. Similarly impressive is the selection of games, new and old alike. From the double playfield-using Banzai Run to the 1977 Superman, old-school gamers looking to log some time at their favorite machines have a good chance of finding them here. Black Knight, Gorgar, Sorcerer- eighties pulp fantasy art drips off these games. Fighting game aficionados need not feel left out, though. SNK vs. Capcom, Street Fighter Alpha, and other fighting game staples get their own row of freshly restored cabinets. Beyond its varied, well maintained collection, the Wizard further differentiates itself from its peers through the technical expertise of its staff. St. John takes me into the back room, a 3000-square-foot workshop brimming with classic game parts. Extracted monitors sit in a well-ordered grid on the floor. A folding table is covered in tools. Cabinets are in various stages of restoration. "If there's a problem with any of the machines out there," says St. John, "I'm here, I'm on the floor." Her calloused hands speak to her time spent in the guts of these machines. I let Sarah get back to work and make my way around the dimly lit arcade for a final round of note taking. Walking past the rows of beeping, flashing electronic spectacles, it's hard not to feel that you're in the presence of vast work of love. You see it in the mint condition of the Super Sprint steering wheels and the spotless glass on the Galaga machine; in the responsiveness of the Street Fighter II joysticks and the new gloss on the control knobs for Ice Cold Beer. St. John and her team have assembled this place with a reverence and attention to detail you'd be hard pressed to find outside of private arcade collections. The effort hasn't gone unnoticed. Despite the fact that the arcade had its grand opening the day before, during a blizzard, classic gamers from all over New England were in attendance. 'We had a huge turn out," said St. John during my tour. Even as I was talking to her, a number of other middle-aged gamers were asking her about the machines, the collection, and what other games were being restored. While St. John is adamant that her arcade is perfect for date nights and family outings, it's not hard to see the Wizard accumulating its own following of dedicated regulars. Heading towards towards the doors, I take one last look at the newly opened arcade. Down the row of pinball machines closest to the exit, I spot Sarah St. John elbow deep in the Black Knight pinball machine. She patiently tugs at and examines wires, looking back up at the scoreboard every now and then. Besides her is a cart heaped with tools. Captured in the scene is the essence of the arcade itself: a sincere love of gaming and respect for the classic machines that shaped most of our childhoods in one form or another. The Pinball Wizard is located in Pelham, NH on Route 111. Their website is www.pinballwizardarcade.com. Writer, student, gamer Jon Lynch avidly plays old PC games and covers the New England competitive gaming scene when not buried in snow. Article republished with permission.